Selected Works of Charles A. Sanislow, Ph.D.
Depression is characterized by altered sensitivity to rewards, with recent evidence suggesting that the ability to sustain responses to rewards across long experimental tasks is diminished. Most work on sustained reward responsiveness has taken a cat- egorical approach and focused on major depressive disorder. 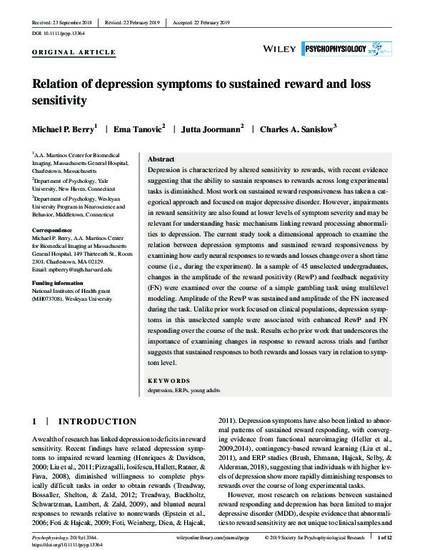 However, impairments in reward sensitivity are also found at lower levels of symptom severity and may be relevant for understanding basic mechanisms linking reward processing abnormali- ties to depression. The current study took a dimensional approach to examine the relation between depression symptoms and sustained reward responsiveness by examining how early neural responses to rewards and losses change over a short time course (i.e., during the experiment). In a sample of 45 unselected undergraduates, changes in the amplitude of the reward positivity (RewP) and feedback negativity (FN) were examined over the course of a simple gambling task using multilevel modeling. Amplitude of the RewP was sustained and amplitude of the FN increased during the task. Unlike prior work focused on clinical populations, depression symp- toms in this unselected sample were associated with enhanced RewP and FN responding over the course of the task. Results echo prior work that underscores the importance of examining changes in response to reward across trials and further suggests that sustained responses to both rewards and losses vary in relation to symp- tom level. Contact Charles A. Sanislow, Ph.D.